Water causes numerous problems in basements, which is why Advanced Basement Systems provides a full line of quality basement drainage systems. All of our patented products provide an effective solution to your basement water problem. If you have issues with water in your basement in Sarnia, London, Windsor, Chatham or nearby, call us today at 1-844-320-1542 or click below. We offer free estimates on all our basement drainage work. At Advanced Basement Systems, we have many products that can collect this water from the walls and redirect it to your below-floor drain -- including our FlexiSpan® Wall Crack System, and our WellDuct® Window Drain. 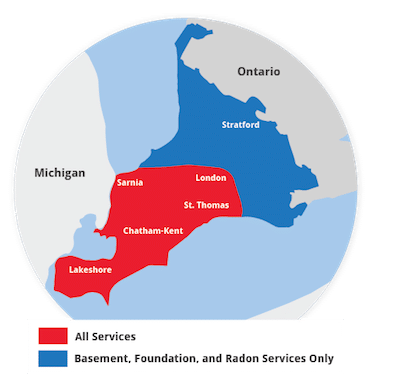 Our Ontario service area includes London, Windsor, Chatham, Sarnia, nearby Windsor, Stratford, St Thomas, Leamington, Essex, Amherstburg, Strathroy and the surrounding area. Don't wait to transform your basement into dry, usable space! Contact us by phone or e-mail today to get started!